After playing Blade Flurry characters for the past 2 leagues (see Breach/2.6 Death Knight build, and 2.6->3.0 Azure Knight build) I've decided to make something new I could play around with - an archer character. Since I hate leveling, I was looking for a way of making at least t15 viable Witch instead, as I already had a spare Necromancer at level 90, ready to respec. The intent of this build was to make something that works best, and if not, great, with one of the Witch ascendancies, without being a "second best" (or 4th, or 5th, you get the idea) option. After "failed" attack based Voltaxic build, I found something that I actually like - also, since Voltaxic build didn't really work as I would like to, I couldn't name it after sacred D&D deity. Therefore, Lolth, Lady of Chaos, is reborn. This build utilizes no poison mechanics, which are complete garbage in post 2.6 era, and no CI, since it can get expensive to scale both damage and ES at the same time on gear, since CI was nerfed hard. WARNING: Plenty of lag, stutter and low fps as my laptop is ancient, for what I apologize. Videos are to show survivability/dps/clearspeed, nothing else. Wicked Ward: Will greatly boost with your defenses, a must have. Profane Bloom: Great leveling help, explosions quickly destroy packs and enemies take 10% more damage. Void Beacon: 20% Chaos penetration - the only way to reliably lower chaos resistance in the game. Vile Bastion: Additional ES regen when you clear packs, makes mapping a lot safer and even Breaches can be "safely" cleared if you are careful. A crafted +3 bow will be your end game weapon, Maraketh base being the best, thanks to extra movement speed. But really, just go for one with attack speed higher then 1.45 <- it makes a big difference. If you cannot afford such a bow, you can always use Silverbranch, and later upgrade it with a prophecy to +1 Bow +1 Gems. For Headgear, we use The Gull. Not only it has decent Life and ES stats, but lesser Shrines are awesome - granting +35% life and AoE, or +85% ES/Evasion, +35% generic damage, 17% movement speed or 5.8% mana and life regen. If you cannot get it or buy it, use any rare helmet with life and ES. Gull is not necessary for this build to work, but having decent life/es/resistance and a cool mechanic, makes it better then everything else. Soul Strike adds flat ES, which we desperately need, and triggers our ES recharge a lot sooner. +1 Arrow corruption would be best, but isn't necessary. Rings, Amulet, Boots and Belt are all rare. We are looking for the usual life+resists+ES mods, but you can also try your luck with Essence crafting for extra % increased Chaos damage on rings/amulet. I've used Cherrubim's in 2.6 videos, as it was the best dps armour in the 2.6 patch. In 3.0, however, the BiS is Carcass Jack for added ES and extra AoE damage. Keep in mind that your dps will be slightly lower, and area damage doesn't increase your tooltip, even if it works with CA. 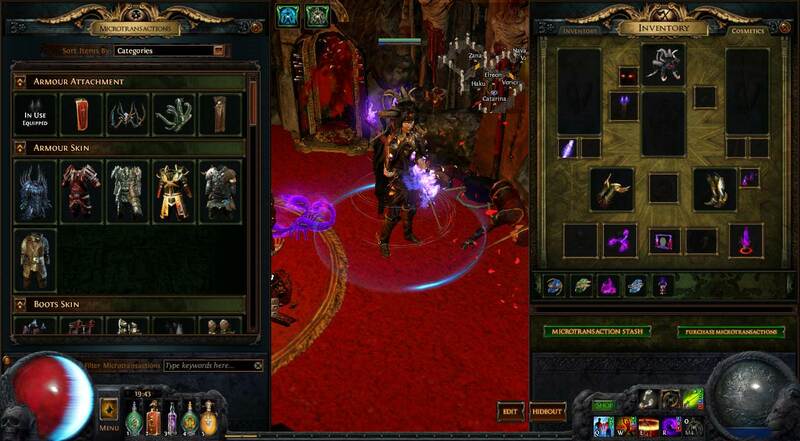 Shaper's Touch are the best gloves for survivability, increasing your life, ES and Evasion all at the same time. One anti-bleed flask as per usual. We do have enough of a life pool for freeze to not be that big of a deal, however, one is still recommended for map mods or strongboxes. Witchfire Brew provides us with Vulnerability and additional DoT damage, we also use Sulphur Flask for more life regen and increased damage. One instant Life flask is also recommended. If you aren't afraid of freeze as much, you might want to get "increased movement speed during flask effect" instead. 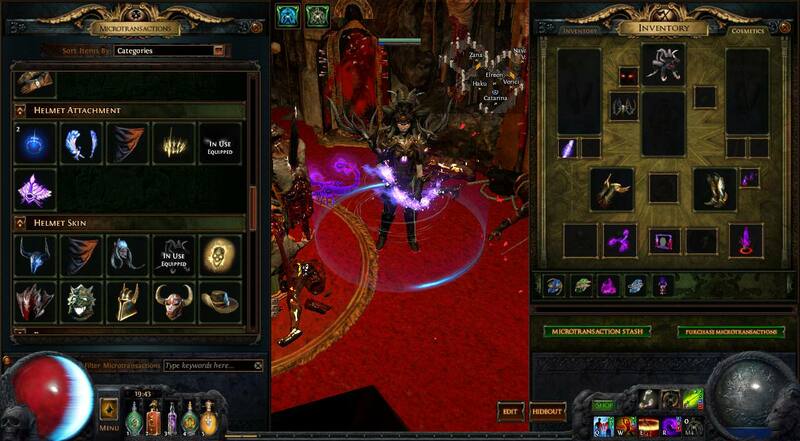 Since there aren't many flasks to increase our damage further, we can also use Divination Distillate for extra loot. We look for Maximum life, Projectile damage, Chaos Damage, Area damage, Damage over Time and generic Increased damage. Remeber that Area damage isn't shown in the tooltip. Gems listed in order of importance. If you have level 4 Empower, use it instead of Slower Projectiles, especially if you have +1 GEM level bow. Flat ES is very important, since we don't actually get that much of it from gear. Greatly increases our survivability, from 5.5k to 14k Evasion, just on its own. Also, it makes Witchfire Brew's and "of Reflexes" flask bonus much stronger, with 22k Evasion when these flasks are active, and over 38k if you also have a Jade flask on top. Nice utility in some maps or a Lab. If you find a spare socket, add Faster Attacks to the mix. Best working in lowish level Cast When Damage Taken setup, so you don't have to waste your time. Mine is a bit overleveled, but I intend to fix this in the near future. Against bosses, you won't have the luxury of 100% Witchfire Brew flask uptime, so this is your cursing setup. This allows you to stack Wither 20 times on a boss if you have 20/20 gems (+140% Chaos damage taken). Otherwise, it is still hefty 15+ stacks, which translates to 105% increased Chaos damage taken. Survivability or clearspeed, whichever works best for you. Either one will do wonders. More mana regeneration is very helpful, as you might find yourself struggling to fire CA if your clearspeed is too fast, which would make Rallying Cry my preferred choice (still need to make a space for it though). Abyssal Cry is also great for increased clearspeed, but also defense, as slowed enemies will take more time to reach you, and spend more time in poisonous clouds. And as always, Enduring Cry for Endurance charges, if you feel like going ham on defense. Just spamming alterations to get +1 Bow gems, +1 gems, or +2 Bow gems will be enough to get you to maps, unles you are using a unique. Step 1: Level up Catarina till 8, or have a friend who can master craft for you. Step 2: Alteration spam on a item level 64 bow till you get a +2 to Bow gems prefix. Step 3: Augment it if it doesn't have a suffix. Step 4: Regal it, and hope for another suffix. If you hit prefix, Scour it and go back to step 2. You can always check prefixes/suffixes on a website like PoEDB. Step 5: If you have a rare +2 Bow gems bow with 2 suffixes, craft Catarina's "cannot roll attack mods" suffix. It costs 1 Exalted. Step 6: Since the bow cannot have anymore suffixes, and the only available non attack prefix is +1 to gem levels, just Exalt slam it to finish your +3 bow. Step 7: Remove crafted mod and craft resist, or better yet, Leo's damage over time mod. - 198k dps with 20 Wither stacks against bosses. - 115k dps with 0 Wither stacks against normal monsters and without Frenzy. Sorry the previous build didn't pan out the way you wanted. I like the switch though. CA + Soul Strike is one of my favorite builds. As a Witch we don't get it from vendors or quests, but there is still Siosa in act 3 and a new gem vendor in act 6 (spoiler alert?). Still, imo, Witch should get it more naturally, as chaos damage is pretty much linked with Witches (Occultist). Base damage of CA is buffed in 3.0, so if damage isn't enough to level with comfortably, it might be in 3.0. Regarding second part of the comment, I love Demon King Horns and used them pretty much since I got it on my BF build. I don't really like the look of Demon King Wings, they look too rigid, and less purple :D They do match the name though (Lolth being Queen of Spiders, DK Wings look a bit like spider legs), so I'll play a bit with them and maybe get used to them at some point. I still don't know if I'm going to start 3.0 with this build or BF one, as that one proven to be easy to level and really strong, so I can farm end game bosses for loot reliably. CA however, especially after a buff, will be much better for general shaped X map meta speed clear, and much more relax as it is just fire and forget most of the time. If I roll BF, I'll keep Demon Horns there as they do match nicely with Hydra armour. Hello, fellow hipster here (lol). Would this be a good start for a newbie during 3.0? I do like the play style you showed! I believe it might very well be, since the gem is buffed in 3.0 - before this, I don't think Caustic Arrow would be recommended by anyone, especially over Essence Drain, but I think CA playstyle is a much safer in general for someone new with the current changes. - With CA, you don't have to have a good aim vs small groups or singular targets, just shoot in the general area. This has big impact on general clearspeed. - You don't have to manage constant Contagion->Essence Drain casting, you only ever use one skill to clear. It means that gameplay is smoother, feels better (I played ED character in Breach), and even as Contagion+ED has higher damage, clearspeed might be equal or even in favour of CA. - Caustic Arrow is safer in some cases, you can for example shoot around a Strongbox before opening it and just Blink Arrow away, leaving a pile of exploding corspes instead of a pack of enemies. Or spread them out before opening a Breach, engaging a boss, you get the idea. Also, you can run away from dangerous stuff while still shooting behind and killing whatever that is that you're running away from. There is, however, one downside - Essence Drain has better single target damage (which I will try to improve when 3.0 hits, either alternative setup on a weapon switch or reducing amount of gems currently used to fit another 4-6 link or something). Still, I would be cautious if you want to level this as your starter, like I said, I haven't leveled with this character so I don't know much about progression or how fast it is when leveling (compared to other options). Maybe most build authors wouldn't say this, but I don't want to mislead anyone if I haven't tested stuff myself. Unless someone else says it's good to go or I level with the build myself, I cannot say much about it being a great starter, other then speculation :D I might, however, make a character and bring it at least to level 30 to see if it is a good idea. Updated with bow crafting section and PoB code / stats in 3.0. Thank you for your hard work, I will definitely be using this guide for help as i level something very similar in my first ever playthrough! Hey friend, i'm looking for something to play into maps. So far i'm interesting in your Azure Knight build and this, what do you think would get running easier/faster and survivability wise? thanks.